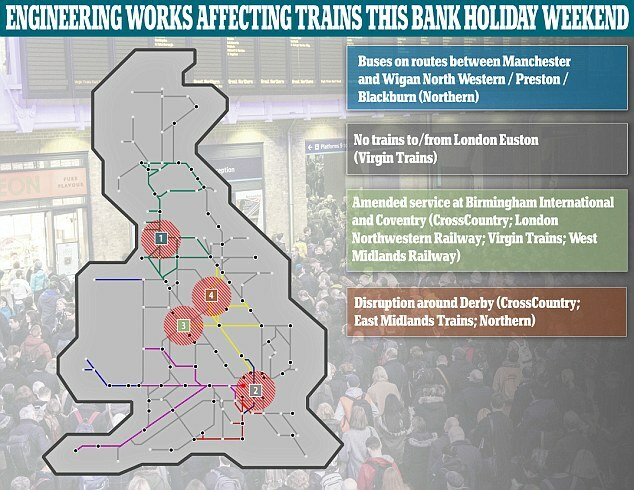 Britons going on a bank holiday getaway face a 'perfect storm' of transport chaos thanks to major train stations being closed, airport strikes and roadworks. One of the biggest ever August bank holiday rail engineering schedules will see 9,600 Network Rail workers carry out more than 400 works costing £84million. Britain's fifth busiest station London Euston will be closed for the whole weekend, with west coast main line passengers told to avoid all but essential rail travel. Other towns and cities which will be affected by works this weekend include Derby, Coventry, Birmingham, Manchester, Wigan, Preston and Blackburn. Meanwhile Highways England said 300 miles of roadworks will be lifted for the weekend, but they will still be in place on 3 per cent of motorways and A-roads. And Highways England roadworks lists showed more than 150 sets of roadworks caused delays of more than 30 minutes, clogging roads last week. Meanwhile holidaymakers flying out from the North West face chaos after staff at Liverpool John Lennon Airport voted to strike for 36 hours over a pay offer. The move by the GMB union means 80 workers from firefighting services, control room, engineering and airport bird control will walk out during the weekend. There are also fears of more two hour-plus passport control queues at London Heathrow Airport for non-European passengers, as happened last month. Mr Baldry, the owner of IBPTS travel consultants, added: 'Rail engineering works are taking place over three weekends. Add in strikes, timetable change chaos and hot weather delays. Euston is being closed for three consecutive weekends, with no trains to or from the London station the weekend just gone, August 25-27 and September 1-2. It is part of an upgrade plan, which includes Network Rail replacing North Wembley junction - a major intersection on Europe's busiest mixed-use railway. Martin Frobisher, managing director for the London North Western route, said: 'There is never an ideal time to shut the railway but these three weekends are the least disruptive times to do it. 'We have worked together for the past three years with train operators to carefully plan this closure of the railway in a way that minimises impact on customers. 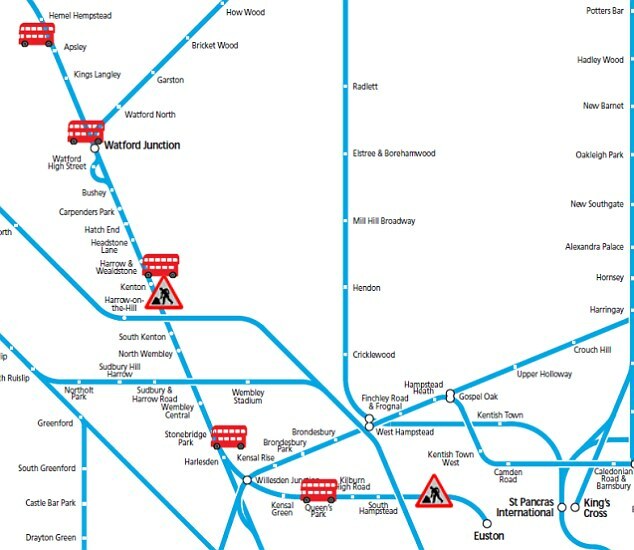 Peter Broadley, executive director for customer, operations and safety at Virgin Trains on the West Coast line, said: 'With no services in to or out of Euston we strongly advise our customers to avoid travelling to London on the days affected. Andy Thomas, Network Rail's managing director of England and Wales, said: 'This bank holiday weekend, thousands of rail workers across Britain will be delivering essential improvements that will lead to faster, better services and help relieve over-crowding to respond to the huge growth on Britain's railways.